If your kids are as crazy for minions, Gru, and a funny trio of sisters as mine are, then they will surely want to dress Despicable Me Halloween costumes. The hit 2010 movie, which had a sequel arrive in theaters in July 2013, had many memorable characters and a story line that is sure to make you laugh and warm your heart. This July 10th, the Minions Movie premieres to adoring fans. I cannot wait! Gru is an infamous evil scientist who has seen his glory days pass him by. in order to secure the ever lasting fame and control of the world that he so desires, as well as the approval, of his mother, he decides to shrink the moon and steal it. But first, he has to find a way to steal the shrink gun from Vector, an up and coming young evil scientist who has possession of it. Helping Gru along the way are his trusty army of minions, yellow creatures who speak funny and like to hurt each other. Along the way, he meets three orphaned sisters to help him with his plan. Gru adopts them, and uses them as his unknowing accomplices. He unintentionally finds himself loving them like daughters. When his sidekick, Dr Nefario returns them to the orphanage, Gru feels awful, even after he steals the shrink ray and the moon. The movie ends with Gru and the girls reunited and becoming a loving family. There are several different costumes for your family to wear. For non-costume lovers who want to get into the spirit of the holiday, then this minion headband paired with a themed tee shirt and blue jeans can substitute as your costume. 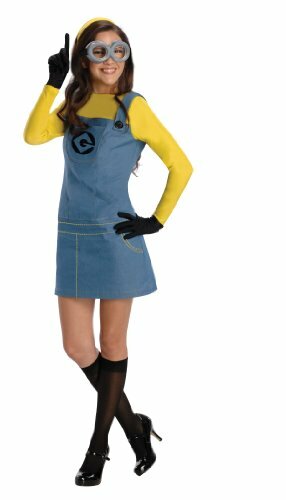 The minions are probably the most popular characters in Despicable Me, and Halloween costumes of these funny creatures are on the top of many children's costume lists. Both of these minion costumes are made of foam, so it will keep both children and adults warm. This Despicable Me Halloween costume is Dave. His eyes Credit: www.amazon.comare slightly crossed and his tongue is sticking out and his hair is parted down the middle and lays flat. Jorge is the other minion. His eyes set straight and his mouth is in a wide tooth grin. Jorge’s hair stands up like blades of grass. Gru has a tough as nails outside, but for his girls, Margo, Edith and Agnes, he is as soft and fluffy as the plush unicorn he won for Agnes at the amusement park. The costume includes black pants, a dark gray striped scarf, a gray shirt and the Gru mask. Carry a ray gun as an accessory and you will look just like Gru! Agnes is the youngest sister and the most adorable. She is naïve and looks past Gru’s nastiness and sees that one day he will do as she asks. With her big eyes and pouty mouth, she eventually gets her way. Agnes costume is a jumpsuit with blue coveralls and a yellow striped shirt. It also comes with the pony tail headpiece, which is just how Agnes wore her hair in the movie. Your daughter can carry a small stuffed unicorn like the one Agnes has in the movie. Vector, who is an inept evil scientist, is highly insulted when Agnes asks him repeatedly why he is in his pajamas during the day. He tells her that he is not wearing pajamas, he is in a warm up suit. This orange colored Vector costume comes with the mask so everyone will know who you are. Despicable Me Halloween costumes are a great a family or as a group costume. Trick or treating will be fun wearing one of these! This is a ladylike costume that is for women. Great ideas! Thanks for the article. We just love the movie! Thanks!